The Social Liberal Party (Portuguese : Partido Social Liberal, PSL) is a right-wing to far-right conservative political party in Brazil. Founded in 1994 as a social liberal party, the PSL was registered on the Superior Electoral Court in 1998. Jair Messias Bolsonaro is a Brazilian politician and retired military officer, serving as the 38th President of Brazil since 1 January 2019. He served in the country's Chamber of Deputies, representing the state of Rio de Janeiro, between 1991 and 2018. He currently is a member of the conservative Social Liberal Party. Luciano Caldas Bivar is a Brazilian politician and businessman who was the PSL candidate for the 2006 Brazilian presidential election. His political platform included projects such as the end of income tax in favour of a unique tax on products and services, and also building military barracks in Brazilian favelas. He received 0.06% of the total vote in the first round and did not progress to the second round. The Superior Electoral Court is the highest body of the Brazilian Electoral Justice, which also comprises one Regional Electoral Court in each of the 26 states and the Federal District of the country, as determined by Article 118 of the Constitution of Brazil. Livres is a Brazilian social-liberal political movement which joined the Social Liberal Party (PSL) in 2016 to reinforce the political party's social liberal values. Leandro Narloch is a Brazilian journalist and writer. He worked as a reporter at Veja magazine and as an editor at Aventuras na História and Superinteressante magazines, all published by Grupo Abril. The impeachment of Dilma Rousseff, the 36th President of Brazil, began on 2 December 2015 with a petition for her impeachment being accepted by Eduardo Cunha, then president of the Chamber of Deputies, and continued into late 2016. Rousseff, then more than 12 months into her second four-year term, was charged with criminal administrative misconduct and disregard for the federal budget in violation of article 85, items V and VI of the Constitution of Brazil and the Fiscal Responsibility Law, article 36. On 5 January 2018, conservative and former Social Christian politician Jair Bolsonaro became a member of the party, which prompted the Livres wing to leave the party in protest of Bolsonaro's social conservative views. After the exit of Livres, the party followed a national conservative path, changed its colors from purple to the more nationalist blue, yellow and green (the colors of Brazil’s flag) and since then has discussed a name change either to Republicans (Republicanos) or Mobilize (Mobiliza). On 5 March 2018, Bivar stepped down from party’s presidency and Gustavo Bebianno was appointed as acting president. The flag of Brazil, known in Portuguese as Verde e amarela, or less usually 'Auriverde, is a blue disc depicting a starry sky spanned by a curved band inscribed with the national motto "Ordem e Progresso", within a yellow rhombus, on a green field. 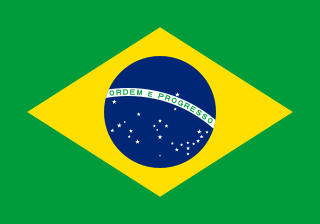 Brazil officially adopted this design for its national flag on November 19, 1889 — four days after the Proclamation of the Republic, to replace the flag of the Empire of Brazil. The concept was the work of Raimundo Teixeira Mendes, with the collaboration of Miguel Lemos, Manuel Pereira Reis and Décio Villares. Progressistas is a centre-right and conservative-liberal political party in Brazil. The Popular Socialist Party is a social democratic political party in Brazil. Podemos, previously known as the National Labour Party is a Brazilian political party which supports direct democracy. The Social Democratic Party is a political party in Brazil led by Gilberto Kassab and uniting dissidents from various political parties, especially the DEM, PSDB and PP. The PSD supported the impeachment of Dilma Rousseff. Sérgio Olímpio Gomes, best known as Major Olímpio, is a Brazilian police officer and politician, member of the Social Liberal Party (PSL). He was a state deputy for São Paulo, and leader of the Democratic Labor Party (PDT) during his term in the Legislative Assembly of São Paulo (ALESP). In the 2014 state election, he was elected federal deputy for São Paulo. Events in the year 2018 in Brazil. Luiz Philippe of Orléans-Braganza is a Brazilian political scientist, activist, entrepreneur, and member of the House of Orléans-Braganza. He was elected Federal Deputy for São Paulo in the 2018 Brazilian elections for the Social Liberal Party with 118,457 votes. Ana Caroline Campagnolo Bellei is a Brazilian politician, lecturer and historian. Michelle de Paula Firmo Reinaldo Bolsonaro is a Brazilian former parliamentary secretary of the Chamber of Deputies. She is married to President Jair Bolsonaro, and is thus the current First Lady of Brazil. ↑ "Estatísticas do eleitorado – Eleitores filiados" (in Portuguese). Superior Electoral Court. July 2018. Retrieved 13 October 2018. 1 2 3 "Em que acreditamos" (in Portuguese). Social Liberal Party. Retrieved 6 November 2018. ↑ "Bolsonaro uniu agenda liberal ao conservadorismo" (in Portuguese). 28 October 2018. ↑ Scuch, Matheus (5 January 2018). "Bolsonaro decide concorrer à Presidência pelo PSL" (in Portuguese). GaúchaZH. Retrieved 6 November 2018. ↑ Fucs, José (5 January 2018). "Com chegada de Bolsonaro, Livres anuncia saída do PSL". O Estado de São Paulo (in Portuguese). Retrieved 6 November 2018. .
↑ Pearson, Samantha; Magalhaes, Luciana (28 October 2018). "Far-right populist Jair Bolsonaro wins divisive Brazil presidential election". MarketWatch. Retrieved 6 November 2018. ↑ "Jair Bolsonaro seeks top judge to become Brazil justice minister". BBC News. 30 October 2018. Retrieved 6 November 2018. ↑ Venaglia, Guilherme (5 August 2018). "Com discurso militarista, PSL de Bolsonaro lança Major Olímpio ao Senado" (in Portuguese). MSN. Retrieved 6 November 2018. ↑ "'A political rupture': far right ready to roll in Bolsonaro's Brazil". The Guardian. 3 November 2018. Retrieved 7 January 2019. ↑ "Príncipe da família imperial brasileira será candidato a deputado federal". Gazeta do Povo (in Portuguese). 2 March 2018. Retrieved 13 October 2018. ↑ Holderf Nascimento, Raul (7 May 2018). "Monarquistas se aproximam de Bolsonaro e reforçam base de apoio do presidenciável" (in Portuguese). Conexão Política. Retrieved 13 October 2018. ↑ Amendola, Gilberto; Venceslau, Pedro (5 May 2018). "O séquito de Bolsonaro já tem um príncipe". O Estado de São Paulo (in Portuguese). Retrieved 13 October 2018. "Brazil's right-wing presidential frontrunner says he's an 'admirer' of Trump" . Retrieved 2018-11-24. ↑ "PSL - Partido Social Liberal 17" (in Portuguese). Social Liberal Party. Retrieved 13 October 2018. ↑ "Partido Social Liberal - Nossa História". psl.org.br (in Portuguese). Retrieved 2018-11-24. ↑ "Partido Social Liberal". Pslnacional.org.br (in Portuguese). Social Liberal Party. Retrieved 13 October 2018. ↑ Constantino, Rodrigo (28 January 2016). "PSL se renova e foca mais no "liberal" da sigla. Ou: It's happening!" (in Portuguese). Retrieved 13 October 2018. ↑ "Impeachment de Dilma: saiba como votou cada um dos partidos na Câmara" (in Portuguese). Agência Brasil. 18 April 2016. Retrieved 29 October 2018. ↑ "Deputado Jair Bolsonaro anuncia filiação ao PSL" (in Portuguese). G1. 5 January 2018. Retrieved 16 July 2018. ↑ "Jair Bolsonaro: Far-right candidate wins first round of Brazil election". BBC News. 8 October 2018. Retrieved 6 November 2018. ↑ Gamarski, Rachel; Adghirni, Samy (8 October 2018). "Bolsonaro Election Effect Turns Brazil's Congress on Its Head". Bloomberg. Retrieved 13 October 2018. ↑ "Deputados estaduais eleitos no RJ; veja lista" (in Portuguese). G1. 8 October 2018. Retrieved 13 October 2018. ↑ Pessoa, Gabriela Sá; Saldaña, Paulo (8 October 2018). "PSDB cai pela metade na Assembleia de SP e PSL se torna principal bancada". Folha de S.Paulo (in Portuguese). Retrieved 13 October 2018. ↑ Faiolo, Anthony; Lopes, Marina (7 October 2018). "Brazil's far-right candidate takes big lead in presidential election". The Washington Post. Retrieved 6 November 2018. ↑ Londoño, Ernesto; Darlington, Shasta (28 October 2018). "Jair Bolsonaro, Far-Right Populist, Elected President of Brazil". The New York Times. Retrieved 6 November 2018. ↑ Grillo, Marco (29 October 2018). "Um dia após vitória de Bolsonaro, PSL troca presidência do partido". O Globo (in Portuguese). Retrieved 6 November 2018.